Payroll vouchers in Tally ERP 9 plays an important role to creating the different payroll reports. You can easily create payslip, statement of payroll, attendance sheet or attendance register using these vouchers. There are three types of Payroll vouchers you can use in Tally ERP 9 software. These are Attendance voucher Payroll voucher and Payment voucher. You can Press Ctrl+F1 to active the payroll vouchers from Gateway of Tally. Payroll vouchers is used to record the attendance or production detail of your company. After filing the attendance or production detail you can start processing on Payroll voucher to calculate the payroll amount. Now you can easily payment the salary of all the employees which payroll amount is calculated in active company. Most of the person want to know about the Payroll vouchers in Tally ERP 9. Now, this article helps you to resolve your query regarding the payroll vouchers. Three types of payroll vouchers in Tally ERP 9 with the name of Attendance, Payroll and Payment vouchers. You can input the required information on these vouchers to generate different payroll reports. Attendance voucher is an important part of Payroll. You can use attendance voucher to record one or more employees attendance data. The attendance is based on the daily (present or absent) working days or production types (Overtime hours). You can easily record any employee attendance or production units in active company. You get the flexibility to record attendance either from any single or multiple attendance vouchers as per your need. During working on Attendance voucher you can use Alt+A (auto fill) shortcut key. It is used to automatically fill the required attendance or production related data. You can use this feature for any one or more employees to fill the attendance for specific period. To record this detail in attendance voucher you have to take following given steps. Step 1: Open the Gateway of Tally (GOT) > Payroll Vouchers > Press Ctrl+F5 to open the Attendance voucher. Step 2: Press F2 and set the date 30-8-2017 and press enter to lock the date. Use Attendance auto fill advance feature to fill the payroll detail of employee by pressing the Alt+A shortcut key.Fill the voucher date 30-8-2017. Select the Primary Cost Category: If you already create another cost category then select that one. Employee Group: Select All Items if you want to generate payroll voucher for all employees. You can also select any specific employee name also. Attendance/Production Type: Choose the required attendance or production type form the given list of options and press enter key. Step 3: If you need to give the additional information then use narration field and save the entry. 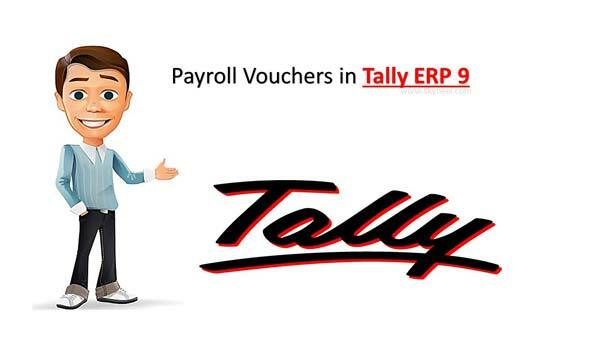 The Payroll voucher in Tally ERP 9 is used to record and compute the value in different pay heads for one or more employees. You can use different earnings and deductions pay heads as per your need in active company. To record this detail in payroll voucher you have to take following given steps. Step 1: Open the Gateway of Tally (GOT) > Payroll Vouchers > Press Ctrl+F4 to open the Payroll voucher. Step 2: Press F2 to set the date for Payroll voucher and then press Alt+A to quickly fill one or more employee details. Process for: Select the category or group name which you create. From (blank for beginning): Fill the starting date for the month of Aug 1-8-2017. To (blank foe end): Fill the ending date of Aug month 31-8-2017. .Employee Group: You can select one or more groups as per your need. Payroll Ledger: Select the Cash in this field and press enter. Now you can view all the values are automatically filed in different pay heads for one or more employees. Step 3: Save this voucher. You can use Payment voucher to record the payment of salary of any one or more employee in active company. Before start recording the entry in this voucher you have to create bank account in your company. To make entry in this voucher you have to follow given simple steps, have a look. Step 1: Open the Payment voucher from GOT > Accounting Vouchers > Press F5. Step 2: Press F2 and fill the date in the respective date field and press enter. Press Alt+A to quickly fill the one or more employees payroll detail. You must have to choose bank name in Bank / Cash Ledger and Salary Payable in Payroll Ledger option in Payment Auto Fill box. Step 3: If you need then fill the narration and press enter key to save the transaction. To view different Payroll Reports you have to go on GOT > Display > Payroll Reports. Now you can choose any required option to view or print the Payroll reports. I hope this article helps you to understand about the processing on Payroll Vouchers in Tally ERP 9. If you have any query regarding this guide the please let me know. Thanks to all.